For part 1 of Beyond the Box Score: Navy Game, click here. The Cougars scored on a 27-second, two-play drive in the 2nd quarter. 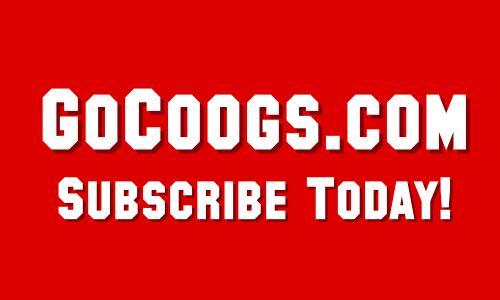 Officially, the Coogs have now scored in under a minute 13 times this season (not counting last week’s scoop and score and the pick six in the Navy game). If you don’t count the kneel down to end the game, the Coogs had 12 possessions against Navy. UH scored 7 TDs on those 12 drives. After the punt to open the game, UH scored on 7 of 10 drives. On those 12 drives the Coogs scored on 3 passes, 3 rushes, and an INT returned for TD. 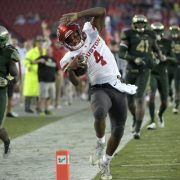 In 4 games in the conference against Navy, the Coogs have now had 45 drives and scored on 26 of them – 22 TDs and 4 FGs. Three receivers went over the 100 yard mark in the Navy game. Marquez Stevenson (141 yards), Courtney Lark (106), and Keith Corbin (104) pulled the rare feat. How rare? UH went 111 games (73 wins) since the last time it had been done. That day, November 29, 2008, L.J. Castile (144 yards), Kierrie Johnson (142), and Tyron Carrier (101) did it in a 73-14 win over Rice at Robertson. 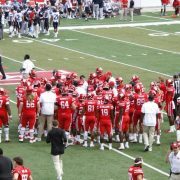 Bonus stat: in that win over Rice in 2009, UH scored 59 points in the first half, tying a school record for most points in a half. The game they tied? The 95-21 win over SMU … which happened 29 years ago yesterday: October 21, 1989. Lark’s 100-yard receiving day was the first of his career. Keith Corbin recorded a career-high in yardage (104) and Stevenson had his second-best receiving day (177 at Texas Tech) . The new redshirt rules have forced us to play the what-if game. Now that players get 4 games to play in without burning a redshirt, we have to guess if the staff is intending to redshirt certain players. When Bryson Smith came into the game at QB instead of Tune or Dormady, it led to a thought that perhaps the two quarterbacks are redshirting. I’d expect Dormady to go somewhere else in 2019. If he is, in fact, redshirting and if he, in fact, wants to go elsewhere and has made that known, kudos to the staff for honoring his request. This is all pure conjecture on my part. UH went 8/10 on third down conversions Saturday. Last year vs Navy, UH was 3 of 12. UH is 18th in scoring margin this season at +13.5 ppg and 15th in home scoring margin at +21 ppg. Navy went over 33 minutes between scores in the middle of the game. From the time they went up 24-14 in the 2nd quarter, UH outscored the Mids 35-0. Navy ran just 35 plays for 112 yards in that span. In comparison, the Middies had 112 yards in the 1st quarter alone. The 2018 senior class has 35 wins and counting. The Coogs finished with 570 yards of total offense against Navy.D’Eriq King ran for 56 of those yards. The 514 other yards of offense (receiving or rushing) came from 12 guys, 11 of whom did not record a rush or catch in last year’s Navy game. Only Mulbah Car showed up in that box score – and he had just 7 yards. In effect, 507 yards of offense were by guys we didn’t have on the field a year ago. 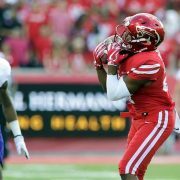 Ed Oliver finishes his career against Navy with 30 tackles, 22 solo, 7.0 TFL, and 3 sacks.